The Sporades islands are some of the closest to Athens with a short flight time of 40 minutes to Skiathos the only island of the bunch to have an airport. 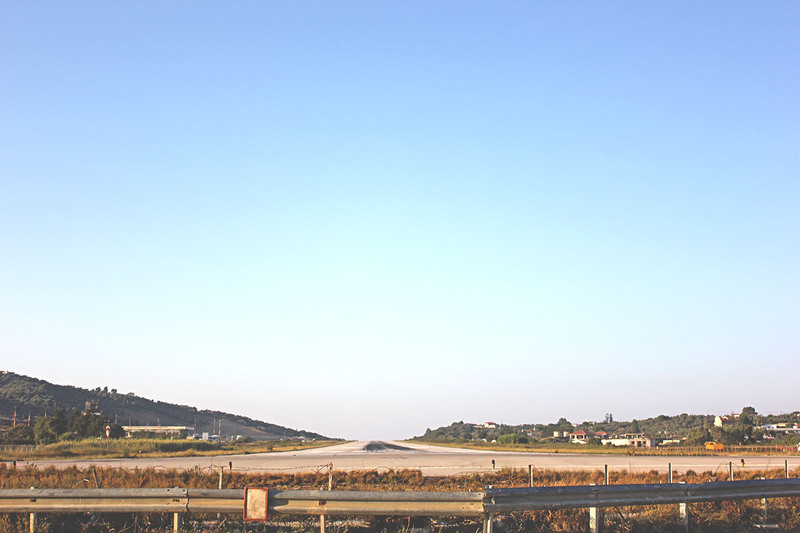 I would highly suggest flying between the islands and Athens even just to experience the runway at Skiathos. Flights on this route (£30 each way) are also as cheap as the ferry and bus alternative. The Sporades are a beautiful set of islands with brilliant blue waters, lots of hidden beaches, are relatively un-touristy (except in July and August) and some of Greeks less developed islands. The islands themselves are relatively hilly and getting around it best done with a very small car. Skiathos has the most developed bus system for the public but unless you are travelling solo I would recommend just hiring a car. Skiathos is the easiest to reach as it has an airport located on the island and charter flights come straight here from the UK. Although smaller than Skopelos this island is the most build up of them all and seems to attract many British holiday-makers on Thomas Cook/Thompson packages. This isn’t necessarily a good thing but as long as you know what to expect it won’t ruin your trip. Skiathos Town is the main hub of the town, located 2km from the airport and where the main port is too. You’ll find a street dedicated to shopping here, many water-side tavernas and more which are not, there are hotels and pensions for staying in and daily boat trips to many destinations. 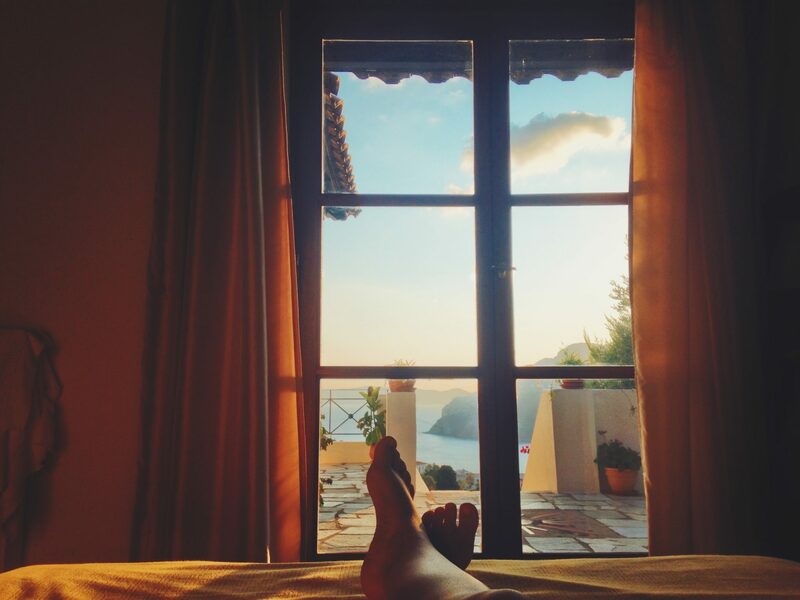 Where to stay (on a budget): I stayed at Pension Angela but AVOID at all costs. You may have seen from my Twitter during my stay the awful state of the bathroom and the terrible rooftop terrace. These were not the only problems: there was no reception and I had to wait 15 minutes for the owner to turn up on check in, I was given no details when I paid and she then immediately disappeared. Basically it was terrible and although cheap at €31 a night I would have expected a little more! Hotel Australia was my second choice and not much more expensive, the location was better and the reviews do seem a little bit better too. If you have all the money to splurge there are some nice hotels on the south coast of the island. Where to eat: I loved Dinos and Nikos tavernas both located on the main street in Skiathos town. 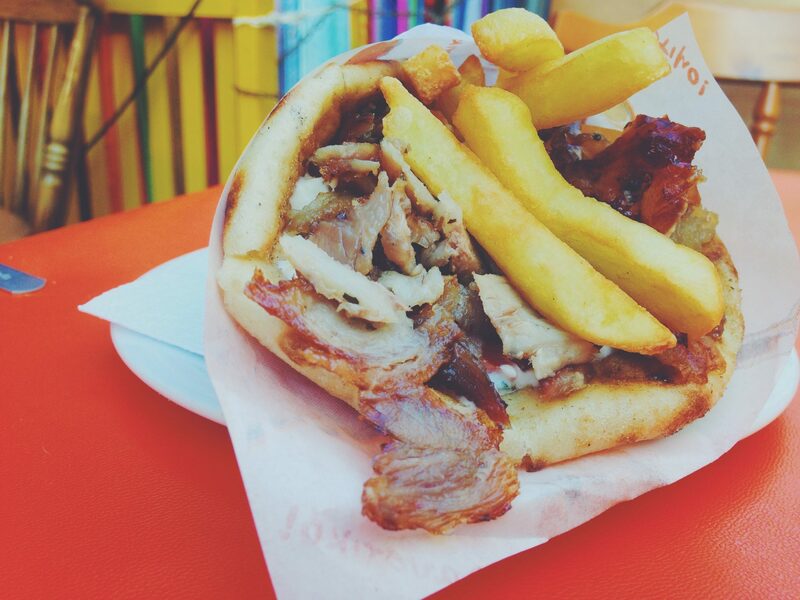 They served good pitta gyros for €2.50 which makes for a very cheap and quite filling dinner. They also had larger plates like gyros portion, souvlaki, kebabs and other more typical English food these were around €8-10.For drinking the Rock and Roll bar has a great happy hour and even better cocktails, they are located in the old port on the stairs which makes for a fun seating arrangement. Some of the tarevnas along the water edge (Golden Cafe and Old Port) also do good breakfast but I’d pay more for breakfast than I would for dinner doing this. Which beaches to go to: Megali Ammos — I walked to the beach closest to town on my final day as I had all of my bags with me and wanted an easy option. It, however, wasn’t the greatest beach I went to during my here and was packed between 10 and 4 with zero free sun loungers. I also found the water here to not be as clear. Agia Eleni — This beach became part of our boat trip when it had to take a detour and I’m pretty glad we stopped here. It is suppose to be one of the most romantic beaches of the island because you get the best sunset views from here. The water was crystal clear and as well as a few beach tavernas and sun-beds there was the option of water sports from €15. What trips to take: Along the old port are an array of boats which do trips around Skiathos taking in some of the nearby small islands, the blue caves and a few other stops. From the new port are boats which take you over to Skopelos to Mamma Mia inspired trips to those locations used in filming. The company I used called Kalypso run both of these trips and are the closest boat to the port. I took the the around Skiathos trip which should have stopped at two points on the north coast and then a the Greek mainland, unfortunately due to high winds the trip had to stay on the south island. We managed to still get to the mainland for lunch and visited some other spots on the south. You can also take the bus which has numbered bus stops around the islands to explore further afield. Skopelos is the biggest of the islands although only reachable by ferry or water taxi from another island in the Sporades or the mainland surrounding this area. This island came to fame a few years ago as it was one of the locations for the movie Mamma Mia, the church and many beaches from the film are located here. 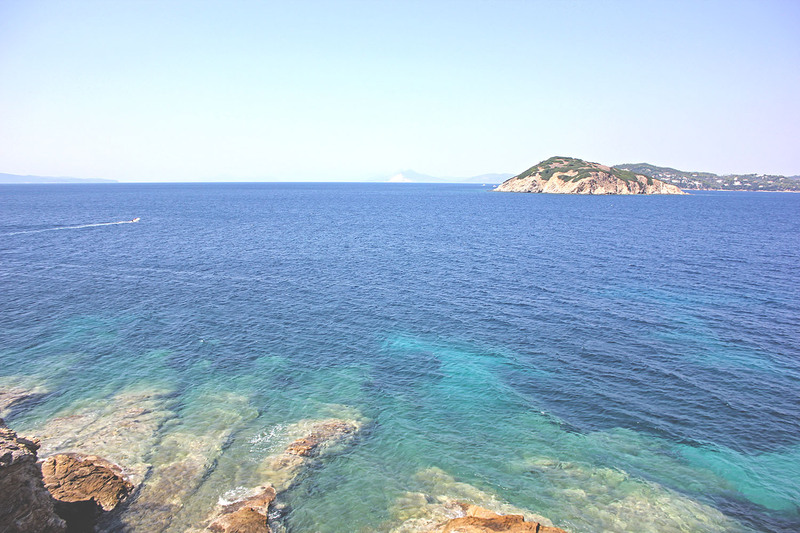 There are two ports to Skopelos, Glossa in the north of the island and Skopelos Town in the south. I was based in the town and stayed here while working as a holiday nanny for a family. My suggestions below are all family friendly for small children. Where to stay: Villa Kamáres — As part of my holiday nanny job I stayed in a villa with the two families I was working for. 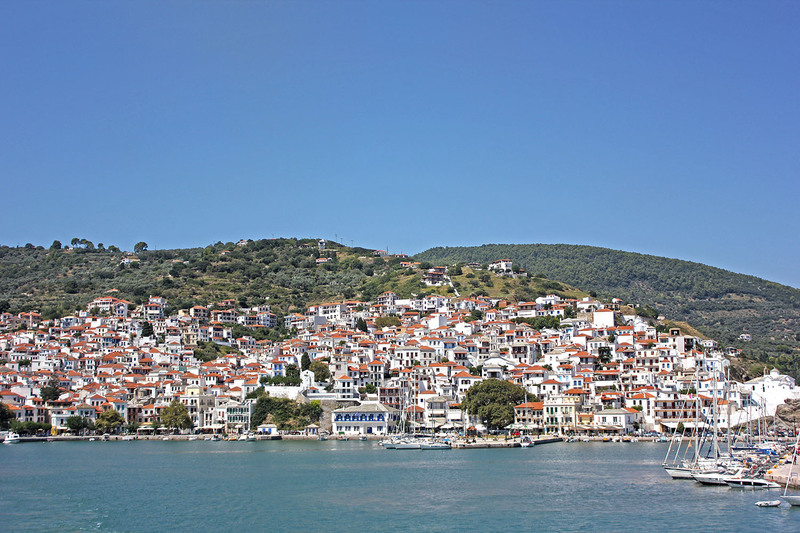 They had chosen to stay in Skopelos town and our villa was located in one of the hills behind the town. It was very hard to find and the drive up was pretty scary, you had to put the car in 1st gear and put your toe down to make it up and around some of the corners! Still, despite this the villa was beautiful and the view was amazing. From my room upstairs I was able to look out to the sea from my bed. It was perfect for families and the children as there was plenty of space to play and a pool. Where to eat: In Skopelos Town all of the tavernas facing the port have friendly service and similarly priced food and drink. They all sell very similar food including typical greek dishes to the English favourites. At the beaches there are lots of tavernas along the beach front, these are all similar and of all the ones we ate at I never experienced anything bad. 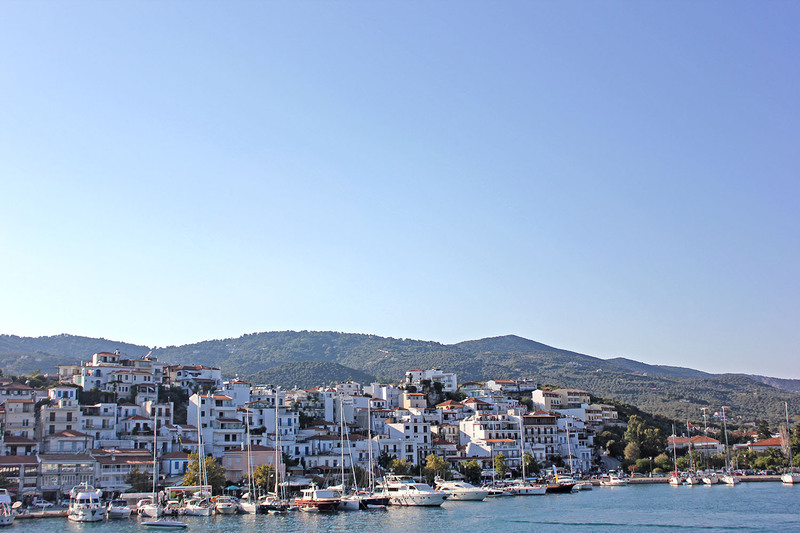 Skopelos prices are slightly cheaper than Skiathos. 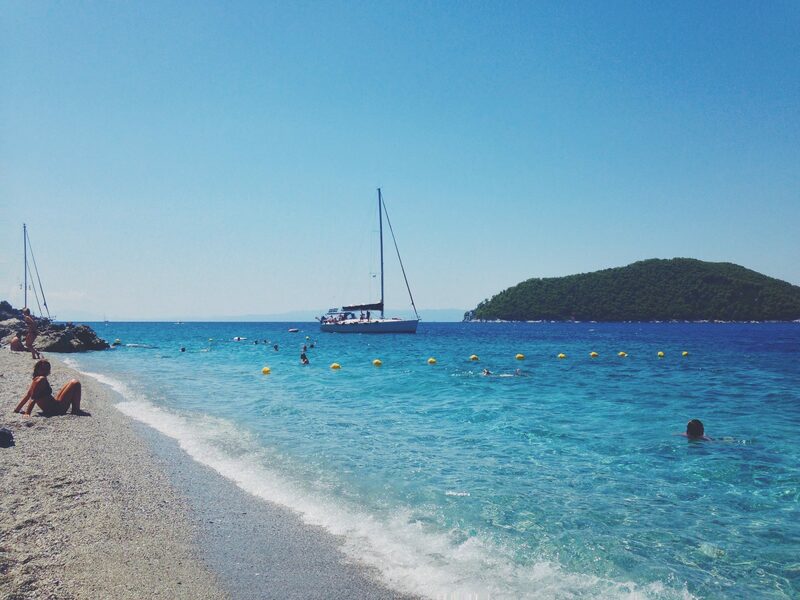 What beaches to go to: Kastani Beach — I would highly recommend this beach, it was the most beautiful beach I visited in Skopelos and one of those featured in Mamma Mia. Although a pebble beach it still manages to look white and of course the water is perfectly clear. The swimming conditions are good for children although it does get deep pretty quickly. It gets busy here so arrive early to grab a sun bed for the day. 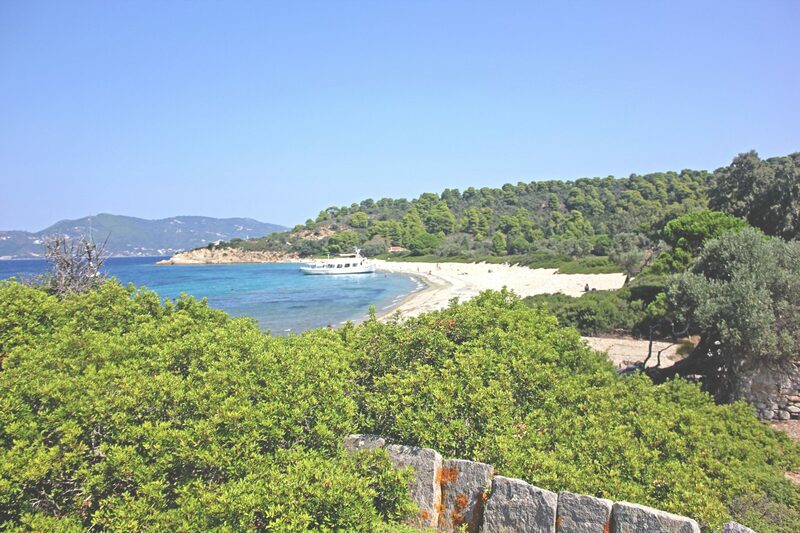 Panormos Beach — We visited this beach twice while in Skopelos and it really was one of the best beaches for kids. The water is calm, shallow and pretty warm too. You’ll find several beach tavernas here to eat at, I’d suggest going to the ones on the left – there is more choice and less wasps. Again, arrive early if you want to secure a spot on a sun bed. 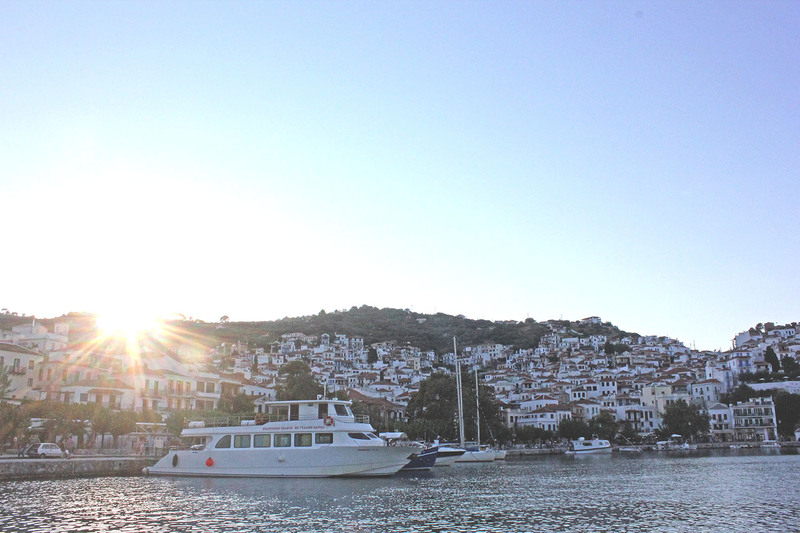 What trips to take: I didn’t get to take any trips while in Skopelos but the families I was working with were able to hire a boat for the day. This took 10 people and they spent the day sailing around the area of Skopelos and Alonnisos stopping off at a beach for lunch and having many different swimming stops. There are also lots of boat trips on offer when you don’t have to hire the whole boat, you can book these in the port area of Skopelos town and most of them take you to Alonnisos marine park. 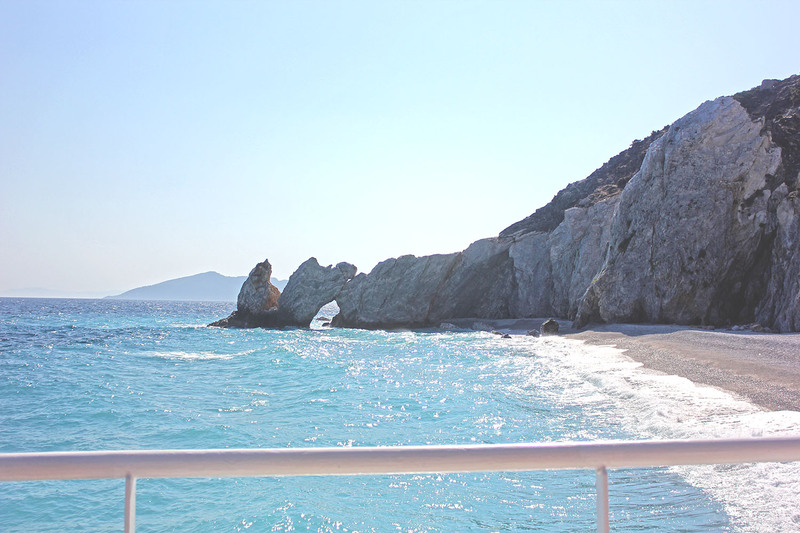 I visited Alonnisos very briefly between leaving Skopelos and going to Skaithos on the ferry. The port town is much smaller than the other two islands and I would say it essential to have a car to travel around this island. There wasn’t much too the town but I did have the best food I’ve eaten in Greece here. I also noticed that the water here was a lot clearer including in the port and the town had a beach which isn’t true of the other two islands. 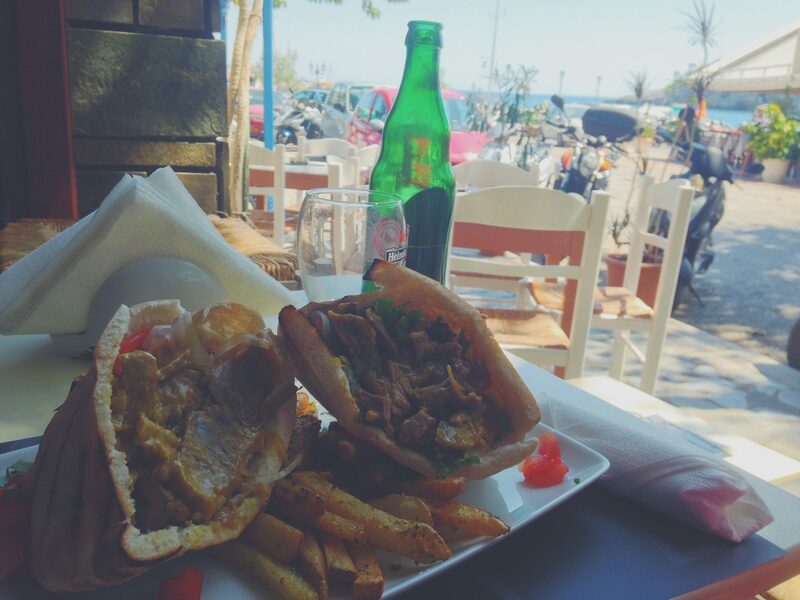 Where to eat: Mavros Gatos — The pita filled sandwiches here are amazing, the portion is huge for the price and it is 100% delicious. I had the pork option which came in a delicious sauce and with fries. The cafe reminded me of something you would find in Melbourne, it felt very hipster and have great views of the town from their open windows. 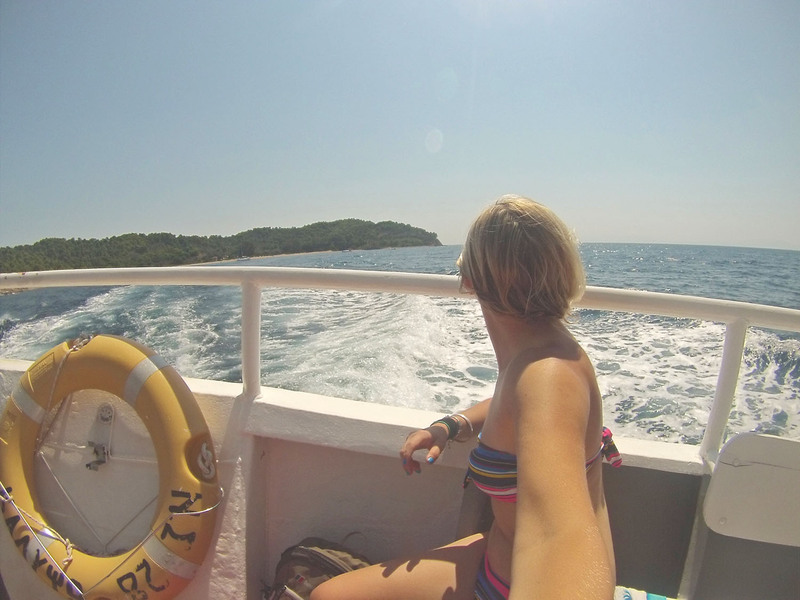 I visited Sporades as a solo traveller (once my job had finished) but wouldn’t recommend doing so, there are no hostels and I found making friends and socialising very hard. Skiathos and all of these islands are much better visited as a group of people or couple. How to get between the islands: You can take a water taxi between the islands if you are looking for speed and a small boat. This, however, will cost a fortune and if you get motion sickness will be hell. It is much more affordable to take a ferry run by Hellenic Seaways, the speed of the boat will depend on the prices but journeys start from €6. Have you visited any of these islands? What else would you suggest? I’m from Greece but I have to admit that I haven’t visited Sporades islands,yet! You must come to my hometown, Chania in Crete!!!!!!!!!! You will love it!!!!!!!!!!!! Plese,can you tell me a little more about the charter flights from Skiathos to UK? Thanks Madoc, it really was. Thanks Ayla, I would highly recommend this pocket of Greek islands.